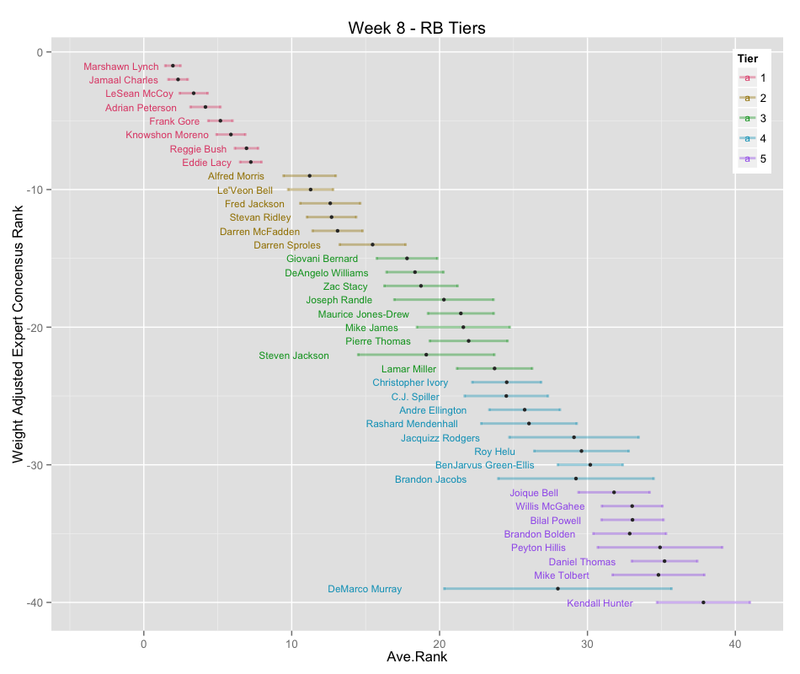 Four new running backs make their way into tier 1 this week. Frank Gore (vs JAX, 3rd for RB’s) coming off a 22-point game, Knowshon Moreno (vs WAS, 2nd for RB’s) with a touchdown for four weeks running, Reggie Bush (vs DAL, 15th for RB’s) who has been deadly when Calvin Johnson is play, and Eddie Lacy (vs MIN, 1st for RB’s). 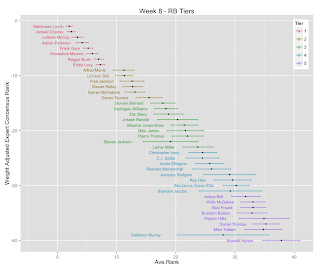 With six teams on bye this week, RB’s start looking dicey in tier 3. I expect high variance in this group. DeAngelo Williams still doesn’t get goal-line carries. Zac Stacy, while looking strong the last three weeks, faces SEA (28th for RB’s). Mike James will have his first NFL start against a hot CAR defense (19th for RB’s). Steven Jackson returns for the first time since week 2 (vs ARI, 24th for RB). Lamar Miller is tragically in a time share in Miami with Daniel Thomas.